A month prior to Paris Fashion Week 2019, the city announced plans to become the sustainability capital of fashion by 2024. In their five-year plan titled “Paris Good Fashion,” the city is seeking to encourage influential leaders in the fashion industry to promote environmentally conscious practices. The plan was unveiled by Isabelle Lefort (a former fashion journalist), Antoinette Gulh (Deputy Mayor of Paris), and Frédéric Hocquard (elected official in the Paris Council) on January 29, 2019. Paris Good Fashion includes a variety of top-tier designers, but fashion professionals and entrepreneurs will also play a key role in establishing a roadmap that will lead to the five-year goal of making Paris the sustainable capital of fashion. Although the official details of the plan will be revealed in June, Vogue cites that key points of the plan will be “to create a circular economy, improving sourcing and traceability, and making distribution, energy and communication–including Paris Fashion Week–more sustainable.” Several notable fashion organizations, including the Ellen MacArthur Foundation, Fédération de la Haute Couture et de la Mode, and LMVH, have pledged support the Paris Good Fashion. 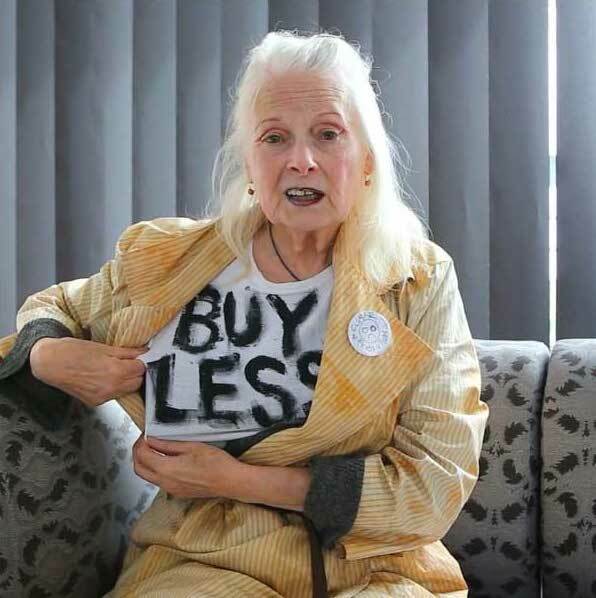 Vivienne Westwood, whose brand has been fur-free since 2017, donning a T-shirt from her collection titled “Climate Revolution.” Source via. Although we are merely three months into 2019, there have already been important indicators that this will be a historic year for sustainability in fashion due to 2018’s impressive momentum. After the report from the UN Intergovernmental Panel on Climate Change (IPCC) was released, in which it was revealed that there are only twelve years left to improve climate change before a point of no return is reached, there has been an increased call for more sustainable practices in the fashion industry. In 2018, the value of the ethical clothing market increased by 19.9%, as reported by Ethical Consumer. The fashion industry, in return, has responded. For example, brands like Chanel, Versace, Gucci and Burberry, have announced plans to go fur free and/or exotic skin free. As Fashion Month comes to a close and fashion houses gear up for their next round of resort, couture and ready-to-wear shows, the practices of influential fashion houses will be under increased scrutiny. Although the specific details of Paris Good Fashion have yet to be revealed, it will be interesting to note whether or not designers feel the need to take initiative and act proactively. Get updates on our blog posts and upcoming events!